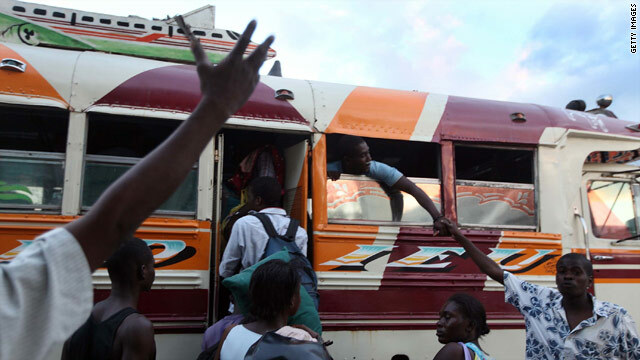 People prepare to leave Port-au-Prince, Haiti, on a bus Saturday. (CNN) -- As delivery of aid to Haiti is hampered by damaged ports and an overwhelmed airport, another conduit into the earthquake-ravaged nation -- its border with the Dominican Republic -- has become a challenging crossing itself, a United Nations situation report says. The 200 miles from the Dominican capital of Santo Domingo to the Haitian capital of Port-au-Prince has been backed up and can take as long as 18 hours to travel by vehicle, according to the report from the U.N. Office for the Coordination of Humanitarian Affairs (OCHA), released this weekend. A CNN crew reported taking 12 hours to drive from Santo Domingo to Port-au-Prince on Tuesday, though the crew left before dawn, intending to avoid peak traffic. Vehicles crossing from the Dominican Republic into Haiti included large trucks carrying supplies and vans and public buses that seemed to be local, the crew reported. Some aid trucks were followed by sport utility vehicles, likely transporting international aid personnel. Traffic is heading the other way, too, the U.N. reported. "Hospitals in the border region [in the Dominican Republic] are overwhelmed and have begun to refer patients to hospitals in other cities," OCHA reported, citing the Office of the Resident Coordinator in the Dominican Republic. "There is a shortage of specialized medical supplies, equipment, and physicians at these hospitals, and no clear inventory of what is needed," the report continued. "An effective waste management system is required for the border region in order to avoid disease and contamination of rivers." As a result, U.N. aid distribution is being shifted to a different road that goes through the Dominican border city of Jimani, instead of the main highway that leads through the Dominican city of Elias Pina. The CNN crew, which passed through Jimani, did not witness many injured Haitians crossing from there into the Dominican Republic. A giant pothole there made crossing the border there a one-car-at-a-time affair. According to a priest in Elias Pina, Haitians there were worried about their families back home. "There are many Haitians living here in Elias Pina and many don't know anything about their families," the Rev. Mike Seis of the Green Bay Diocesan Mission in Elias Pina wrote in a letter recently. 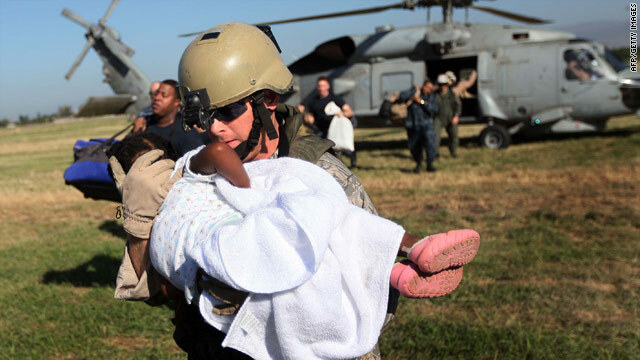 "The casualties are staggering. This weekend all of the Catholic parishes in the Dominican Republic from the 11 dioceses in the country will be sending their Sunday collections to Catholic Charities of Haiti."